Do you know if there’s any standing water in your home? When most people are asked this question they answer confidently. After all you’re talking about your home, a place you know like no other. But what about your crawlspace? You’ve got no reason to go down under the floors of your house most of the time. That is, until something goes wrong. It’s easy for homeowners to forget that they even have a crawlspace until they notice their floors have become infected with mold thanks to standing water left beneath their house. Fortunately for homeowners there are ways to waterproof your Huntsville AL home’s crawlspace so you can avoid all the dangers that mold poses. If your crawlspace isn’t water proof then that means it’s the perfect breeding ground for mold. There’s also the fact that it’s hidden away. What may start as a minor problem can develop into something serious as time goes on and the infestation grows. That’s why it’s important to take advantage of Huntsville AL crawlspace water proofing as soon as possible. As a sidenote it’s not just crawlspaces that have this problem, any dark part of your house that you don’t see very often could be at risk. 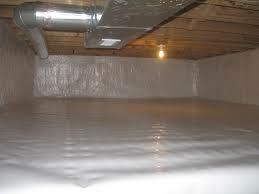 If you want to protect your house from what may be going on in the dark and damp recesses of your home you need to invest in Huntsville AL crawlspace water proofing. Repairing damages caused by standing water can be extremely costly. No one likes to pay for this sort of thing but you have to think in the long term. Spending a relatively small amount now can save you a lot down the road, including a lot of time and the potential loss of valuable items. Too many households have been forced to throw away family heirlooms because of mold damage. You may think that mold isn’t worth worrying about but it can be a serious problem. It can ruin anything porous that it contaminates. This includes insulation, wooden floors, furniture and more. Mold contamination can be very costly from a financial perspective, but it can also cause health problems. Mold irritates the bodies of otherwise healthy people, causing reactions like sneezing, difficulty breathing and other kinds of irritation. Mold infestation is especially hard on children, with some saying that mold exposure can cause kids to become asthmatic. For more information visit the Center for Disease Control’s page on mold infection. The fact of the matter is that mold has no place in a healthy body. Many homeowners don’t feel any urgency when it comes to dealing with potential water problems because nothing has gone wrong yet. That’s an understandable but extremely risky attitude. Homes that don’t have crawlspace water proofing in Huntsville AL face serious damage if even minor flooding occurs. If you haven’t had to deal with any problems arising from your crawlspace you should be thankful, but you should still act as quickly as possible to avoid any future problems. After all, mold that develops in the crawlspace can damage the very foundations of your home. If your home may be at risk it’s time to call the experts when it comes to crawlspace water proofing. One to the Huntsville AL crawlspace water proofing experts can save you time and money down the road.